From February 3rd to April 4th of this year I committed myself to a pilgrimage tour of various Buddhist sites in India, Nepal, China and Japan. It was by no means exhaustive as such a trip would take years to accomplish, but it was overall a very positive experience and I gained much insight as a result. For some amount of time I had sought to visit India and pay respects at the major holy sites. I also had to good fortune to have sufficient time off and finances to do it. On the morning of February 3rd I departed Tokyo for Hong Kong. I was to transfer in Hong Kong and the airline allowed an extended stopover, so I decided to stay one week. As fortunate would have it, a friend of mine named Venerable Huifeng was able to offer me a front-row ticket at Ajahn Brahmavamso's talk entitled “Buddhist Tales of the Supernatural” which was held at Hong Kong Polytechnic University. 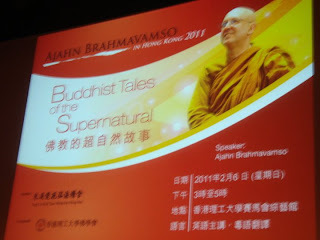 I have enjoyed watching Ajahn Brahm's talks on Youtube.com. I also have one of his books on meditation. In real life he is a superb speaker and skilled teacher. While in Hong Kong I visited two temples worth noting. The first was the Temple of Ten-Thousand Buddhas 万佛寺 in the New Territories. 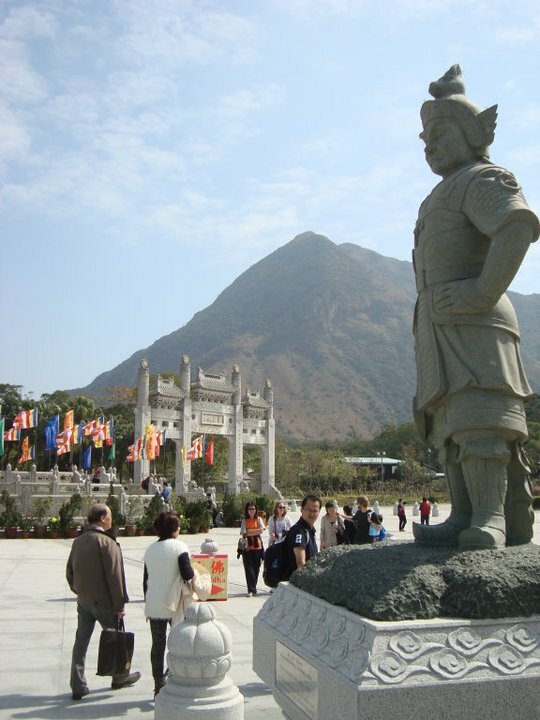 You begin climbing the mountain and flanking both sides of the trail are countless statues of Arhats with various features and expressions. Some are even amusing to look at. I was visiting the temple during China New Year, so there were a great many pilgrims paying their respects at the various shrines. The other temple I visited was Po Lin Monastery (Jewel Lotus Temple) 寳蓮寺 on Lantau Island. To visit the temple I had to take a short ferry trip to Lantau Island which is a larger island to the west. 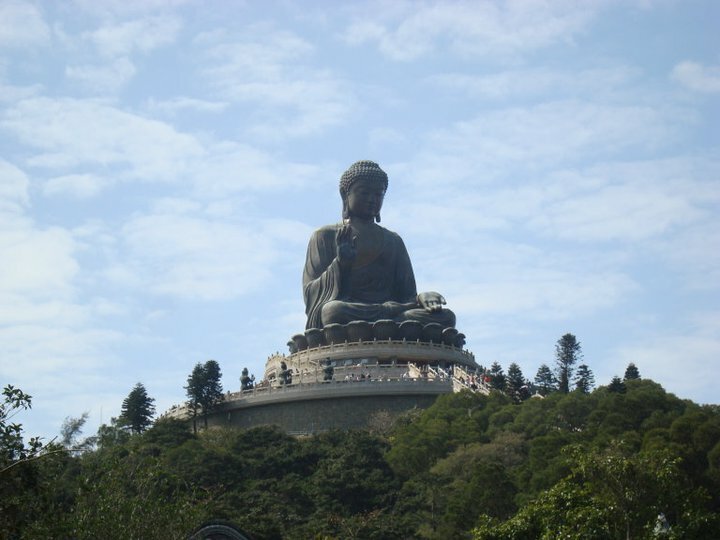 The monastery is famous for their great Buddha statue atop a hill. Again, there were countless pilgrims visiting because it was Chinese New Years. 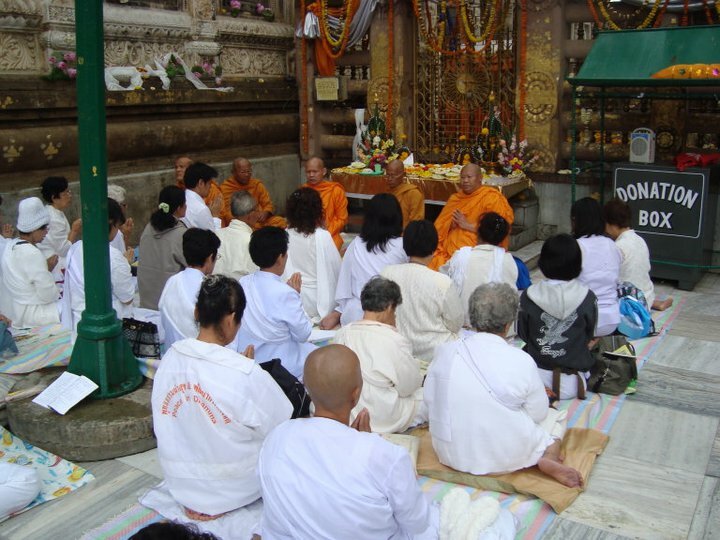 It is tradition for Buddhists to visit temples and pray for good fortune and blessings in the coming year. The temple itself is well-kept and clearly connected to the tourism industry. There are a number of franchises including a Starbucks Coffee shop immediately outside the temple grounds. The temple also neighbours a cable car which offers a view of the airport on the opposite side of the island. After spending a week in Hong Kong I proceeded to New Delhi, India. I will admit that I experienced a brief shock when I arrived. 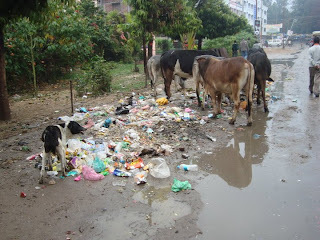 India is a nation with over a billion human beings and it suffers horrendous poverty. In the capital New Delhi one can see wealthy businessmen and turn the corner to see homeless cripples clearly dying of disease in the street. The lack of sanitation and heaps of garbage scattered everywhere you walk was also a bit unnerving. Fortunately, I had a kind of refuge at Venerable Nakamura Gyōmyō's temple in the Kailash Colony area of New Delhi. It was there that we finished the last part of editing for his collection of short stories that I translated from Japanese into English. The book will be published sometime this summer hopefully. At the temple I met a number of visitors from different countries. 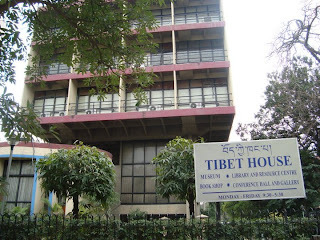 While in New Delhi I had the pleasure to visit Tibet House, which was founded by His Holiness the Dalai Lama. Unlike other museums in India which charge foreigners more than Indians, Tibet House has a set entrance fee that is the same for all. The museum has a number of aged Tibetan tanghkas, statues and bronze pieces that were brought with His Holiness to India when he escaped the Chinese invasion. Not long after I found myself in Bodhgaya, which is where the Buddha attained enlightenment under the Bodhi Tree. To get there from Delhi Station one takes an overnight train and gets off at Gaya. From there one can hire one of many rickshaw drivers who drive to Bodhgaya in about twenty minutes or so. The core of the site is Mahabodhi Temple where the Bodhi Tree stands tall providing shade to the countless pilgrims from many nations who come to pay their respects and make offerings. The temple grounds reflects the spread and extent of Buddhism in the world. In the evening when the heat fades the paths which circumambulate the Bodhi Tree fill with a sea of monks, nuns, lay devotees, tourists, touts and a few stray dogs. In Bodh Gaya I had a very moving emotional experience when I first arrived. When I first entered the threshold of the temple my mind went silent and I became speechless. I wandered aimlessly for a bit in kind of daze before sitting down on a white stone bench and looking out towards the Bodhi Tree I wept tears for what reason I do not know. They were not tears of sorrow. I was overcome with a sense of accomplishment and finality. I felt from the core of my being that I had finally made it to the holiest site in the Buddhist world. It was coupled with a sense of relief and joy. I cannot explain it beyond that. 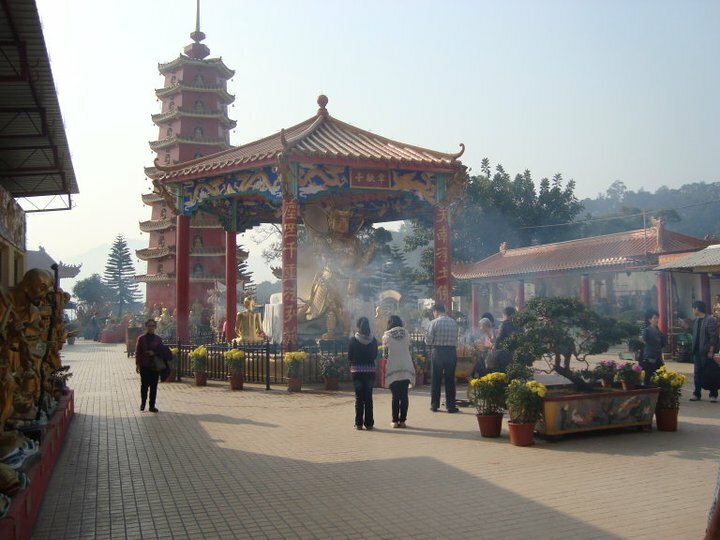 The town also hosts many other temples of different nations. There are Thai, Tibetan, Chinese, Bhutanese, Sri Lankan, Japanese and Burmese temples which provide lodging for visitors. Unfortunately many professional swindlers and beggars also wander around the town preying on foreigners. I also had the misfortune of having my shoes stolen at Mahabodhi Temple. One is required to remove ones shoes before entering the inner part of the temple. I did this and later came back to find my shoes missing. They were far from being expensive shoes and the loss was of no consequence, but I had to walk barefoot to the market where a local boy selling second-hand sandals took advantage of my circumstances and charged me two-hundred rupees for a pair of used sandals! That he was selling used sandals also made me suspect the lot of them were stolen. Still, I was barefoot and needed some kind of footwear, so I bought a pair of beach sandals at the inflated price. 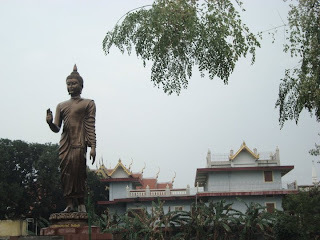 While in Bodh Gaya I also made use of the temple's pilgrimage tour package and was able to easily visit a number of significant locations in the area in a chartered van with a guide including the Shanti Stupa, Vulture's Peak, Nalanda University, Godakatora, the Xuanzang memorial and the Jeevak Mango Grove. If any reader visits Bodhgaya, I highly recommend purchasing this tour package. The package is provided for both tourists and pilgrims alike and is not for-profit. There are also no hidden costs and the vegetarian meals are included. While in Bodhgaya I was introduced to the local branch of Foguangshan 佛光山 which operates a free school and hostel for girls. I have some connections to the organization and it was a pleasure to speak with the venerable nuns who look after the temple and school. One other thing worth noting about my trip is that I just happened by chance to encounter an old friend from a temple back in Canada. I was at an internet cafe and noticed a certain nun clad in maroon robes that looked quite familiar. Sure enough it was a friend from back home in Edmonton, Canada. 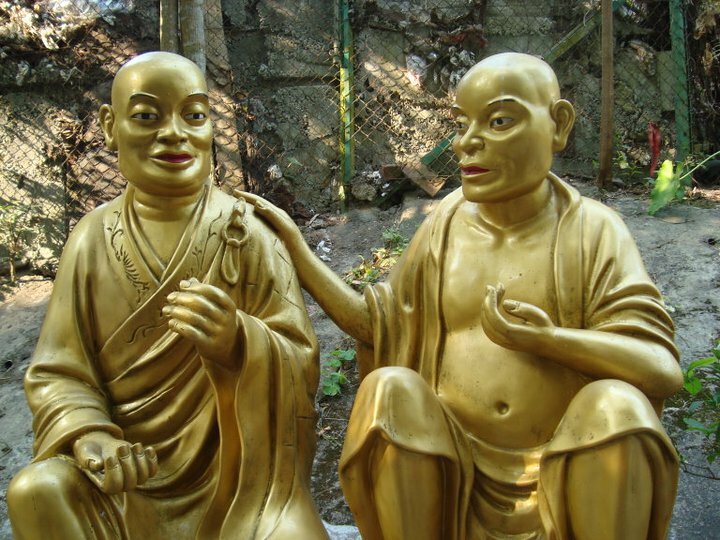 We had no knowledge that the other was in Bodhgaya. Such a chance encounter was cause for joy and an afternoon spent drinking coffee catching up. ...to be continued in Part II. Thank you for sharing - your trip to New Delhi & Bodhgaya is one I hope to take myself some day. Hello Mr. Kotyk, this is pmax3 from Livejournal, perhaps you remember me from our brief conversation about books on Vedic literature. I am just commenting to say I am glad you had such a nice and fruitful trip. I myself have twice made plans to visit Buddhist sites in and around Bihar in India (I have been residing close to the place for some time), but unfortunately I had to cancel my plans both times. Your pictures and descriptions make me realize how much I have missed. I am deeply interested in Buddhism, but right now I am limting my focus to studying Hinduism from the historical as well as the spiritual point of view. 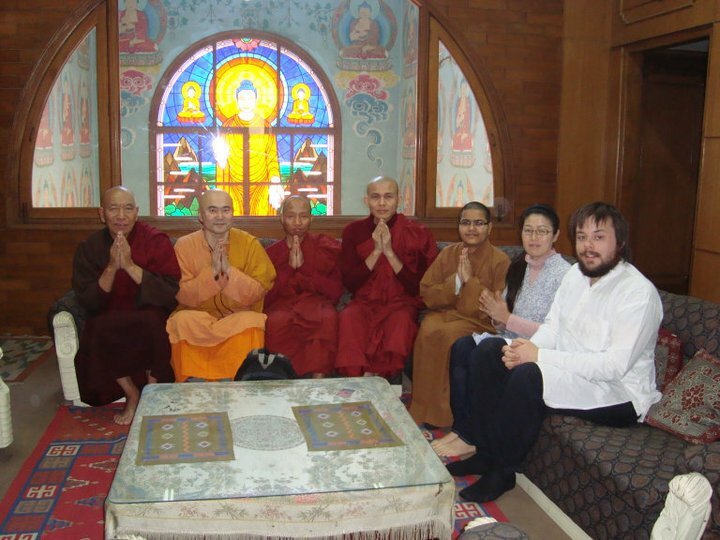 I hope to develop a better understanding of Buddhism and the relation between the two faiths as I go along. Thank you for maintaining this very interesting blog, and hope you don't mind my commenting here. Awesome post and pics Jefferey. All three of us enjoyed your visit here and hope to see you again sometime.